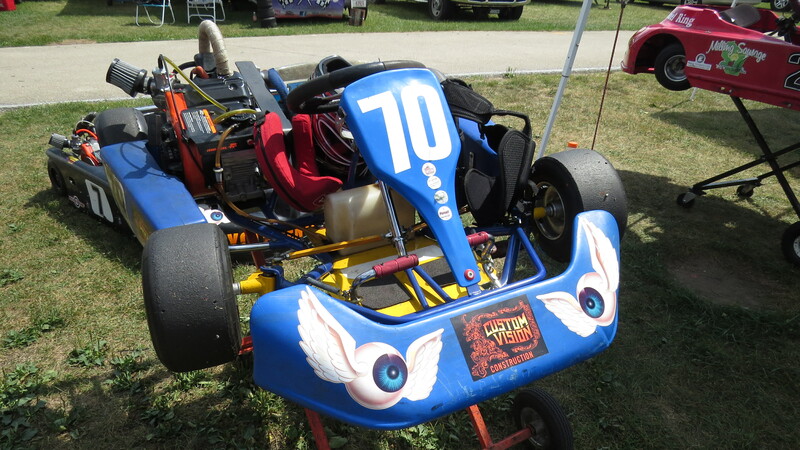 This weekend was spent at at Badger Kart Club for the Briggs Animal Nationals. There are all the normal races but also an extra race for the Junior and Senior Animal classes. Since Badger has a Briggs Animal Sportsman class we decided to leave our animal on after last weekend road race and learn some new tricks. Found an old friend, Jason’s old kid kart. Saturday’s race used the qualifying format, not Jason’s favorite but it would put him right where he should compared to other drivers. As he improved through the day he will an opportunity to move up spots in each race. He qualified 7th right between the track veterans and the newbies. In both the pre-feature and the feature, as expected the fast kids pulled away, while Jason pulled away from the kids that were still learning to drive. He finished 7th of 10 in both races. Really, it was not bad each time he was on the track his lap times improved. Racing on Sunday was a Heat format with a random draw for heat 1, the reverse for heat 2 and the results of both for the feature. Jason started heat 1 in the sixth position. Again, this was a good place for him, since it would give him the opportunity to move forward if he could in both heats. In the 5th lap, one of the newer drivers spun in the hairpin and was t-boned by a faster drivers, causing the race to be red flagged. Jason was in 5th place at the time. Since the was over halfway completed, the placing at that point became official. Thankfully, the injured driver was only sore but his kart was damaged beyond quick repair. The second Heat looked like it was going to start well with Jason making a run on the inside of turn one to pick up a spots but was pushed into the grass causing him to drop far back. Undeterred, he drove fast and made up lots of time and finished 6th. His heat one and two finished put him in the 5 position for the feature. He got good start but dropped a spot, to 6th, a few laps in and stayed there until the checkered flag. The weekend of we will of August 22nd we where at the last race of the Mid-American Sprint Series at Road America. On August 31st we are planning to be at Sugar River again to race with a group of LO206 karts. We owe a great deal of thanks to Regan at 4 Cycle Central who helped us with motor setup and event lent us motor to try. To Karen, who has been by herself for the last two weekends while we raced, but really enjoyed the quiet down time.